Rick Shenkman, an associate professor of history at George Mason University, is the editor of HNN. His newest book is Political Animals: How Our Stone Age Brain Gets in the Way of Smart Politics (January 2016). It has a dreary name: "On the tail risk of violent conflict and its underestimation." But this new paper by social scientists Pasquale Cirillo and Nassim Nicholas Taleb could rewrite the history of violence. It takes direct aim at the thesis of Harvard evolutionary psychologist Steven Pinker in the 2011 bestseller, The Better Angels of Our Nature: Why Violence Has Declined. The paper's already making waves. On his Twitter page Harvard's Niall Ferguson calls it "hugely important." In the paper Taleb, the author of The Black Swan, the blockbuster book that alerted economists to the importance of unexpected events, argues that "Violence is much more severe than it seems from conventional analyses and the prevailing 'long peace' theory which claims that violence has declined." Contrary to current discussions, all statistical pictures thus obtained show that 1) the risk of violent conflict has not been decreasing, but is rather underestimated by techniques relying on naive year-on-year changes in the mean, or using sample mean as an estimator of the true mean of an extremely fat-tailed phenomenon; 2) armed conflicts have memoryless inter-arrival times, thus incompatible with the idea of a time trend. 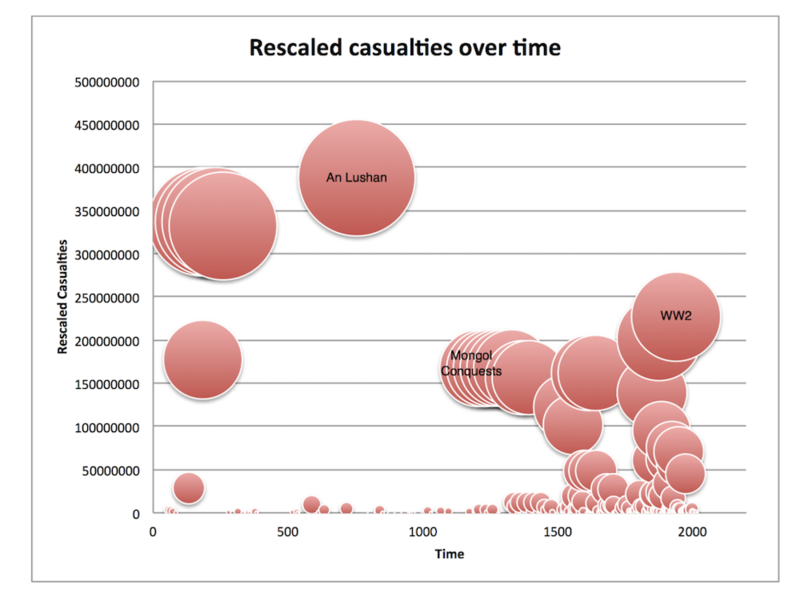 Our analysis uses 1) raw data, as recorded and estimated by historians; 2) a naive transformation, used by certain historians and sociologists, which rescales past conflicts and casualties with respect to the actual population; 3) more importantly, a log transformation to account for the fact that the number of casualties in a conflict cannot be larger than the world population. The authors base their article on the methods of extreme value theory. What's An Lushan? Here's Wikipedia's explanation: "The An Lushan Rebellion was a devastating rebellion against the Tang Dynasty of China. The rebellion overtly began on 16 December 755, when general An Lushan declared himself emperor in Northern China, thus establishing a rival Yan Dynasty, and ended when Yan fell on 17 February 763 (although the effects lasted past this)."